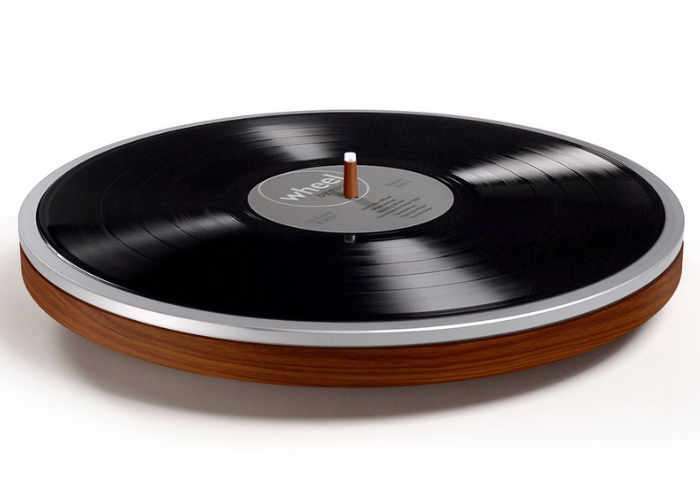 Miniot has created a very minimalist vinyl record player which the development team say finally provides records with the turntable they deserve. What’s the promotional video below to learn more about the minimal design of the Wheel record player which is this month launched by Kickstarter. WheelAs the name suggests is a minimal record player that is simply a wheel, making it easy-to-use and simple to set up. Simply place a record on the wheel and it will start playing the bottom of the LP or single. All functions of the Wheel are controlled by the centre stick. Watch the demonstration video below to learn more. The development team explain more about its technology, design and inspiration. I’ve always admired the technical marvel of gramophone records. And for years, I wondered why the ritual of record playing wasn’t more elegant. The cd made this even worse, and streaming music definitely anesthetized the experience. Thank God the record got a second chance. With Wheel, we aim to honour vinyl and bring Emile Berliner’s creation full circle. All technology is built into Wheel’s platter, below the record. You have an unobstructed view of your precious record, and the delicate stylus is well protected. Everything happens behind the scenes. Because it’s a closed shape, all technology is safely hidden from dust and accidents. Wheel is very easy to use. Wheel is the most compact true turntable you’ve ever heard. Wheel’s linear tonearm is built around the beautiful AudioTechnica AT95E cartridge. With our tonearm, the AT95E offers a warm, rich sound, and outstanding clarity and detail. For a perfect match, the entire arm is micro machined out of a single piece of laminated mahogany. By using a single type of cartridge, we can fine-tune each tonearm for damping, resonance and weight distribution to make Wheel sounds its best. Jump over to Kickstarter for more details and to make a pledge from €472 with shipping expected to take place during October 2017.